Chaos erupted inside of the press briefing room Thursday as reporters clashed with White House Press Secretary Sarah Huckabee Sanders. CNN’s resident clown Jim Acosta tried to pressure Sarah Sanders by asking her to publicly declare that the press is not the “enemy of the American people” as President Trump often says. Of course President Trump is referring to the fake news media because all they do is lie–yes, the liars in the main stream media are the enemy of the American people. Sanders refused to bow down to Acosta and the press pool erupted into chaos. On journalist said of Sarah Sanders after the briefing, ‘She’s going to get us killed’ reported the Daily Mail. Another reporter lashed out at Sarah Sanders and brought up the five people killed at the Capital Gazette, even though the gunman had a longtime vendetta against the newspaper. 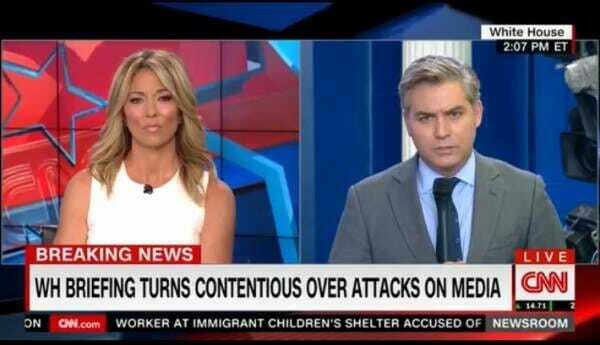 Jim Acosta then went on a long winded rant and called for a protest at the White House after the briefing. Acosta also whined from his Twitter account. Partial transcript and video via the Free Beacon.